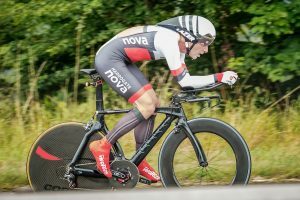 Last weekend Time Trial riders Duncan Mullier and Corinne Mitchell rewrote the Harrogate Nova’s record books with a new men’s 100 mile TT record and women’s 10 mile TT record respectively. Mullier added the 100 record to the 25 and 50 records claimed earlier in the season with an astonishing 11 minutes and 38 seconds improvement on his previous record, with 3:39:38 at the BDCA 100 event on a two lap course in Derbyshire which includes the infamous 6 mile draggy climb of “the concrete mountain”. Conditions were good and Mullier held an aerodynamic position for the whole event to average over 27mph. At the same event Mike Hutchings recorded 4:40:38. 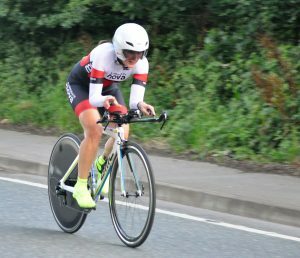 On the same day, on Humberside, Corinne Mitchell knocked 30 seconds from her previous Women’s 10 mile TT club record with 22:30. At the same event Nova riders Tony Kent recorded 22:06, Walter Wilkinson 22:46 and John Tiffany with a personal best of 23:45. The following day Nova’s Jean Croft finished fifth in the 50-55 age category with 25:52 at the National 10 mile TT championships near Keswick. ‹ Mark Ketteringham wins the title!